This song is a motivation song to me. It is one that I want to sing as loudly as I can and really get a place a rocking! 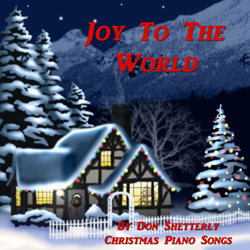 Joy To The World is just one of those happy and exciting songs that shouts JOY! It is victorious and glorious and is something you just want to spread around. The wonders of his love is one of the lines that really tugs at my heart every time I see the lyrics or hear the music. Track #11 of 15 songs on Christmas Piano. The lyrics of Joy To The World were written by Issac Watts in 1719. The melody to this Christmas song was composed by Lowell Mason. Often the music is attributed to George Handel’s “Messiah”. This carol or hymn was based upon Psalm 98. The lyrics were at first given the title, “The Messiah’s Coming And Kingdom”. The story goes that young Issac Watts was bored with the music in church and so his father challenged him to write something better. It resulted in a revolution of church music and Joy To The World was one of those outcomes. Joy To The World was based upon Psalm 98:4-9 which was titled “The Messiah’s Coming and Kingdom.” It has been said that Issac Watts took considerable freedom when created this work since it was based upon this section in Psalms. And heaven and nature sing, And heaven and heaven and nature sings. Repeat the sounding joy. Repeat, repeat the sounding joy. Far as the curse is found, Far as, far as the curse is found. And wonders of his love, And wonders, and wonders of his love.